dbx are a big name in pro speaker-management systems. Now their DSP is available in a format that fits your pocket — literally! While dbx processors such as the DriveRack are in regular use in large-scale sound systems, you don’t often see them on the pub and club circuit. That looks set to change with the arrival of the diminutive goRack. 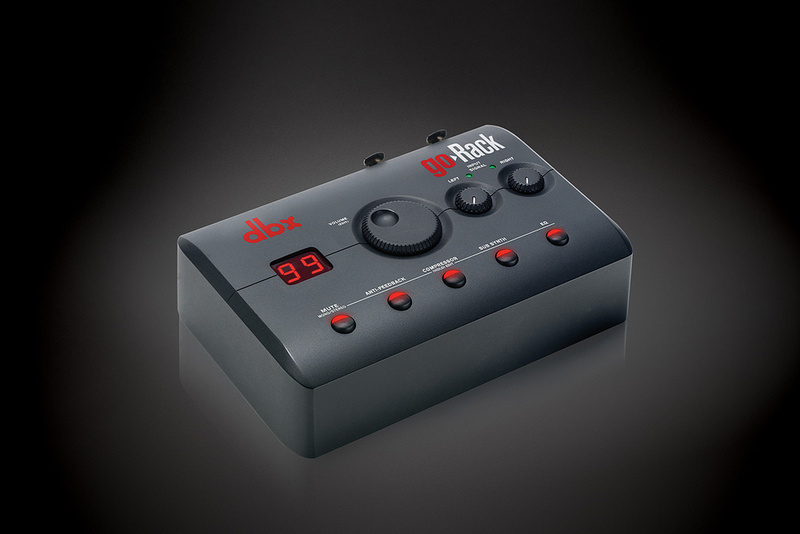 In essence, dbx have filched some of the features from their DriveRack range, simplified them, and crammed them into a tiny metal box that sits in the palm of your hand. The goRack links between your mixer and amps/powered speakers to provide anti-feedback processing (based on the dbx AFS Advanced Feedback Suppression algorithm), compression, sub-harmonic generation, and a selection of EQ presets. There’s also a fixed output limiter built-in. If you don’t have a mixer, the two inputs can be switched via separate rear-panel buttons to handle microphones (though the inputs don’t provide phantom power). Individual processing sections can be activated or bypassed using the top-panel buttons, and their settings can be adjusted using the goRack’s data wheel and two-digit numerical display. There are five buttons: four for the individual processing sections and one for mute. The rear panel houses a pair of balanced ‘combi’ input connectors that can take quarter-inch jack or XLR feeds, while the output is on balanced XLRs. A further aux input allows for the connection of mobile music devices, with three routing options (Mono, Stereo or Advanced) that allow the processing to be bypassed for the aux input, or to be split (in Advanced mode) so that the aux input gets the sub-bass and EQ sections and the main input goes via the anti-feedback and compressor sections. Power comes from an included universal-voltage wall-wart adaptor. A pair of rotary controls sets the left and right input levels, and small signal-metering LEDs turn from green to amber and then red to warn of clipping. Note that the aux input isn’t affected by the input gain controls. The goRack’s inputs are present on ‘combi’ XLR/jack sockets, and can accept either mic or line-level sources (though no phantom power is provided). These are complemented by another stereo aux input on mini-jack, which can optionally be routed through the goRack’s DSP. I was really impressed by the very simple operation of this little box. Active processing sections are denoted by their buttons being illuminated in red, and while the data wheel defaults to setting the output level, if you hold down any of the function buttons, its LED will flash, at which point you can adjust it, the value showing up in the display. Then you just press the button again when you have set the desired value. The anti-feedback processing uses 10 narrow notch filters that lock on to feedback frequencies to reduce the gain in those critical areas. There’s a choice of three notch widths, where the narrowest has the least effect on the overall sound, but they’re all pretty tight and have minimal influence on the overall sound. Once it is turned on, you can ring out the system to kill the most annoying feedback frequencies, then turn the gain down a few dB for the performance. If any feedback is detected during performance, a filter will lock onto it and kill it; once all the filters are used up, the filter you used first will be redeployed. Bypassing this section or powering down clears all the filter settings. Based on the dbx 163 soft-knee compressor, the compression section is designed to tame peaks and to even out levels, though it pays to be aware that the more compression you apply, the closer you get to the feedback threshold, and the anti-feedback section has its limitations. In essence, you switch on the compressor and then use the dial to add more or less of it. This section is very effective at adding weight to voices, and as long as you don’t add too much, the anti-feedback section will keep you out of trouble. The goRack’s sub synth uses dbx’s existing Subharmonic Synthesis process to add a frequency one octave below the existing bass. It focuses on frequencies around the 100Hz region. Unless you have big subwoofers, the tip here is to use it sparingly. The effect is good for beefing up kick drums, bass guitars and of course the low end of EDM material. Again, you just switch it on and then dial in as much as you need. The process can affect vocals and other instruments when used at higher levels, so using the aux input to feed in just those sounds or subgroups that need fattening might be a good idea. For EQ there’s a range of presets that can help overcome deficiencies in the room acoustics or speaker system. Again it pays to be aware that adding more than a little boost in any part of the audio spectrum increases the risk of feedback in that area. All 16 presets are described on the bottom panel of the unit, so you just use the dial to navigate to the one you want. Fortunately all the presets are fairly subtle and offer different cut/boost levels for the highs, lows and mids. Just listen as you dial through them and use that one that sounds best. Finally, the mic preamps work perfectly well if you don’t have a mixer, and in mono mode both channels are mixed. I have to say that I was very impressed by the professional level of performance from this little box, with the anti-feedback section being particularly impressive in killing ringing without messing up the sound. With street prices around the £$100 mark, the goRack is a real winner. In fact I think I need one for my own live gigs. The old Behringer DSP Shark offered some of these options but I think this particular combination is unique at the price. You know how I feel about external PSUs on live gear! A surprisingly inexpensive yet hugely effective piece of kit for the live performer.